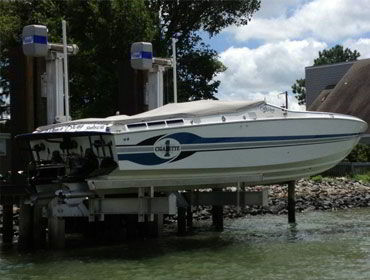 Elevator Boat Lifts are used on restricted waterfronts where outboard pilings are not allowed, such as on narrow canals, or where the driving of pilings is difficult due to hard bottom conditions. 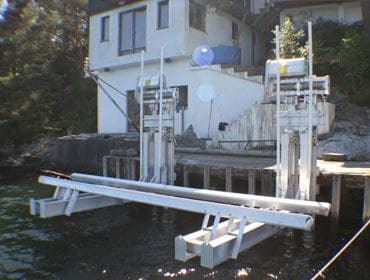 Imm Quality’s elevator boat lifts can be mounted on seawalls or pilings and in a vertical or inclined position. Our elevator boat lifts are gusseted using one-inch thick billet aluminum plates which have CNC machined channels that accept the upper and lower flanges of the carriage I-beam (see video below). No other manufacturer has this feature. Not only does this provide mechanical support for the I-beam, but it also guarantees the correct geometry in all 3 dimensions and fixes the proper angles for the arms. With Imm Quality’s superior manufacturing capabilities, there is no need to worry about over-stressed welds or your elevator arms being out of alignment. Imm Quality Boat Lifts currently offers three models of elevator boat lifts, the Alumavator / Select, the Platinum and the Superlift. The Alumavator / Select is our battle tested chain drive lift and is our most economical, though it comes with many features other companies consider optional upgrades. The Platinum is our maintenance free, direct drive lift with all the bells and whistles. 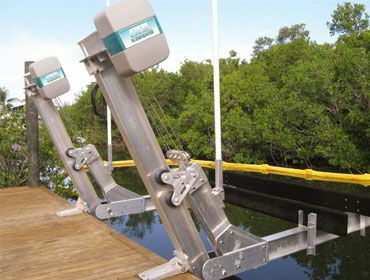 The Superlift is a rugged industrial duty gearless boat lift. Originally designed for marina applications, it is the fastest, most efficient lift on the market and is the lift of choice for the most discerning boaters. To read further about the above our Elevator Boat Lifts, click on the labeled navigation tabs in the drop down menus above or on the images below.